Running a boatyard isn’t for softies. It’s a tough business, says Jim Bronstien, the president and owner of Marine Business Advisors. Boatyards are capital-intensive, customer-intensive, regulatory-intensive, technically intensive and personnel-intensive. And they are lightning rods. “The maintenance-and-repair experience drives the entire boating experience,” Bronstien said during a seminar on the boatyard business at February’s International Marina & Boatyard Conference in Fort Lauderdale. If boaters’ yard experience goes well, they typically will love the lifestyle and stay in boating. “If it doesn’t go well, they’re out of it,” he says. Boatyards draw fire — or praise — from boaters and other industry segments for how successful they are at keeping boaters in boating. A former president and owner (for 21 years) of the Rybovich yacht yard in West Palm Beach, Fla., Bronstien long ago adopted a mantra that has not lost its relevance with time: Do it right. Bronstien says you don’t have to be a big yard to do it right. “It’s about your culture,” he says — the look, the feel, the attitude. Are you a homey, grassroots, tight-knit kind of place — such as TV’s “Cheers,” the bar “where everybody knows your name” — or a more corporate organization with rigid policies and procedures? One type of yard will draw older boats and do-it-yourselfers; another will attract a high-end customer who wants all of the amenities and service perks. Knowing your customer “dictates your success,” Bronstien says, as does recognizing that you can’t be all things to all people. “Every customer is not for every yard. Every boatyard isn’t for every customer,” he says. Bronstien says there is a “moment of truth” in every service experience when the yard either gets it right or doesn’t. Bronstien says different customers will have different expectations at that moment of truth, so it behooves the yard to know its customers well. “You need to know your customer to satisfy him,” Bronstien says. The yard must have some good “people people.” Your great technical people aren’t always your great people people, so you put the right people in the right positions for their strengths, Bronstien says. “Put them in uniform,” he says. “Be professional. Good presentation matters.” Train them. Motivate them. Communicate well with them. A yard’s culture should include ongoing technical training, customer-service training, management training — and team building. “You have to do it, especially in today’s world,” he says. Bronstien says money is not the great motivator it’s cracked up to be. The chance to make a difference is usually just as important, as is the chance to work for a company that is focused and moving forward and setting realistic expectations. Poor communication is at the bottom of most conflicts, he says. The two keys to good communication are no surprises and frequent communication. Bronstien says successful yards promote their strengths — painting, carpentry, engine repair — and work on overcoming their weaknesses. Alternatively, they harness the benefits of first-rate subcontractors to give them strength where they are weak. Bronstien says a yard should be well-kept and have a “professional appearance.” He notes a “paradigm shift” away from yards being the only places that fix boats. Mobile repairmen fix boats at their dock, and yacht management groups, in some cases, take the place of the yard in assuming responsibility for maintaining and repairing boats, “but still the only place to haul a boat is in a boatyard,” Bronstien says. 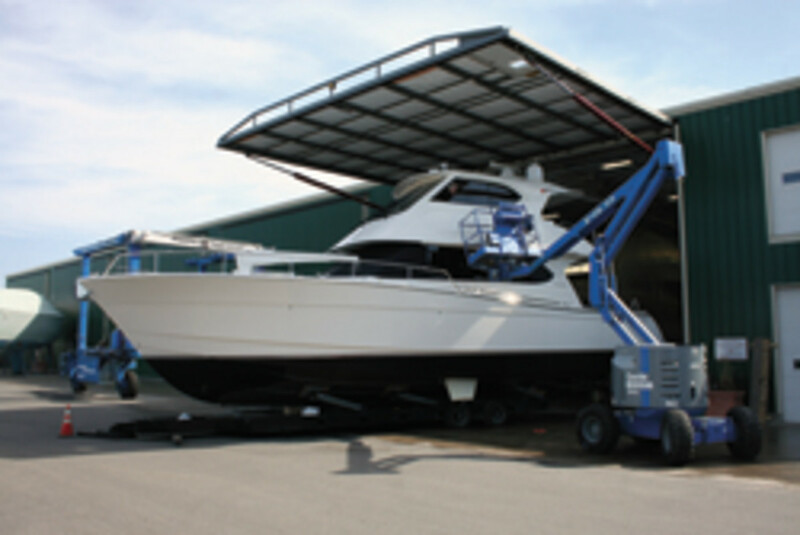 Every yard should have a lift properly sized to the boats it services, covered work sheds where practicable and good safety practices and procedures. He encourages a new paint job, new signage and an investment in landscaping and comfortable lounges to make the facility more customer-friendly. Space should be carefully calculated. Too much can be inefficient; too little can stunt growth. Every yard should look for stories to tell in the press. Yards are engines of economic growth. The refits they do are interesting stories, as are stories about investments in the facility that will grow its footprint locally. Bronstien insists that every yard have a crackerjack accountant or chief financial officer. Know how much money your technicians can bring in every month, and pay them accordingly. Trends to keep track of: billable hours for every worker and labor that brings in money versus labor that doesn’t. Use a sharp pencil when you estimate the cost of a job. “No two are alike,” he says. Lastly, Bronstien says, when collecting money, “Cash is king.” Don’t get stuck with a lot of unpaid accounts receivable.